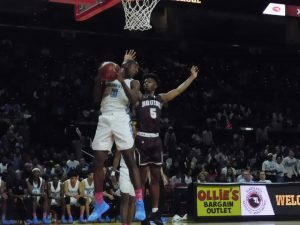 Eleanor Roosevelt’s Cameron Brown snags a defensive rebound in front of Broadneck’s Jamar Young during the first half of Saturday’s Class 4A state boys basketball title game at the University of Maryland. Brown and the Raiders ruined the No. 13 Bruins’ hope of a first title with a 77-48 decision. 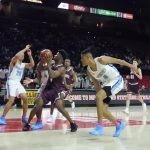 The first state boys basketball championship game for Broadneck High didn’t go unnoticed. 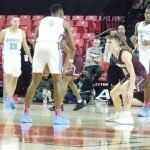 Roughly 2,000 supporters filled the one side of stands facing Gary Williams Court at the Xfinity Center Saturday night for the Bruins’ Class 4A title match with Eleanor Roosevelt. Off to a promising start, the Bruins and their raucous faithful sensed a potential March Madness-style upset of epic proportions. Not long after, however, the proverbial clock struck midnight. 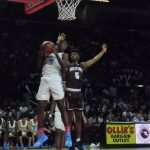 The Raiders from Prince George’s County dominated the final three quarters to claim a 77-48 victory over the 13th-ranked Bruins at the University of Maryland. 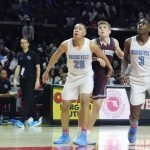 Cameron Brown posted a double-double of 25 points and 14 rebounds for Roosevelt (25-3 overall), and Jaamir Butler added 13. 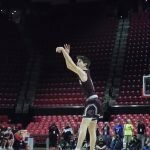 After rallying late past Dulaney in Thursday’s semifinals, the Greenbelt school overwhelmed Broadneck with its quickness and shooting to claim its first 4A state title since 2016 and fourth overall. Perry Hall won the previous two 4A titles after losing to Roosevelt in the state semifinals in 2016. In its first state Final four since 1995, Broadneck (22-6) relished the journey. “I just want to say that I could not be more proud of these guys,” said Bruins coach John Williams, who graduated from Broadneck in 1991 and turned 46 on Thursday when the Bruins defeated Richard Montgomery, 72-57. “If you had told me a year ago that we would be here tonight playing for a state title, I would not have believed you. And, that’s nothing against these guys. The Bruins led 16-7 with 3 minutes left in the opening quarter. 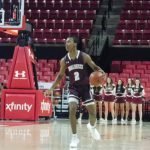 Early in the second quarter, Brown finished a break with an one-handed slam against Broadneck post Logan Vican for a 3-point sending the Raiders faithful into a frenzy. By halftime, Roosevelt, ranked No. 5 in the District region by the Washington Post, had a 45-29 lead and was locked in. The Cape St. Claire school hoped to start the second half quickly, but Roosevelt didn’t allow the Bruins to gain any traction. Brown converted a lob pass from Kyle Rose for an “alley oop” dunk that underscored the Raiders’ dominance as they pushed the advantage to 63-35 after three. The Bruins dropped five daggers in the first quarter and had a 21-18 lead after one. Back-to-back trifectas from Nick Gatton and Mike Cantrell gave the Bruins a 16-7 lead. Then came the second quarter. And the third. Jamar Young led the Bruins with 22 points, hitting seven field goals, including a pair of three-pointers and also went 6 of 7 from the line. No other Bruins reached double figures. 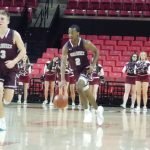 With a veteran lineup featuring seniors Young, Che Colbert, Vican and Cantrell, Broadneck won the Anne Arundel County regular season championship. 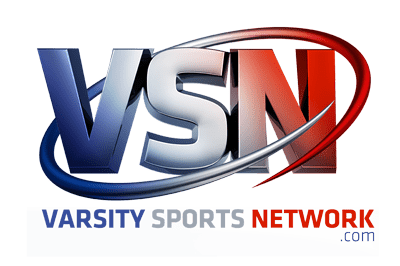 Broadneck – Young 22, Gatton 8, Colbert 6, Cantrell 3, Rose 3, Stewart 3, Vican 2, Waggoner 1. Totals 16 9-14 48. Roosevelt – Brown 25, Butler 13, Simon 12, Gross 10, Rose 6, Cochran 4, Whitley 4, Thomas 2, Mincey 1. Totals 28 12-23 74.